A special fan took in Sunday’s huge Seahawks-49ers showdown at Candlestick Park. You all remember Miles Scott, the 5-year-old boy who is recovering from leukemia. 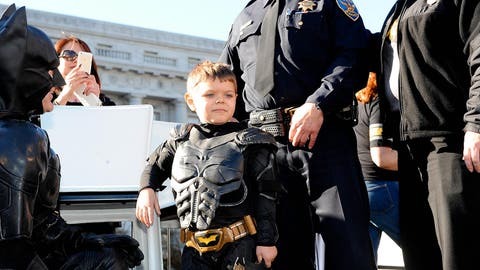 Last month the city of San Francisco turned into Gotham City and he went all over town fighting crime. That special event was set up by the Make-A-Wish Foundation and it was probably one of the coolest things you’ll ever see. Well, he was back in San Francisco on Sunday where he watched his 49ers pull off a thrilling victory over the rival Seahawks. Folks on Twitter were more than happy to see him on the sidelines.